The vintage inspired floral print of this dress is bold and makes a statement without being over the top. Crafted from a comfortable cotton blend, this dress is both cool and comfortable. The lightly pleated skirt flows gently away from the midsection, and the look is completed with long sleeves and a modest scooped neckline. 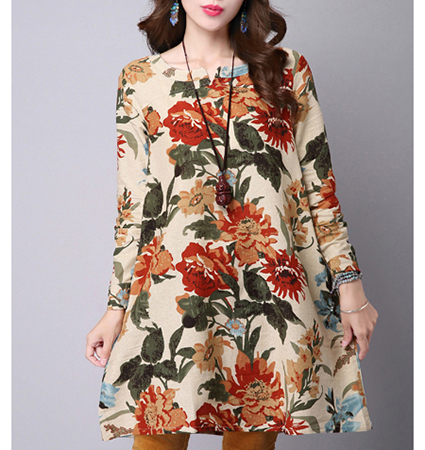 This dress is available in two different prints: vintage apricot or Federal blue. Pair it with matching tights and your favorite chunky boots for the perfect fall look. This dress is available in sizes medium through 2XL.